I’m a big fan of the Nintendo Wii, however trying to find that diamond in the rough is sometimes a little challenging and generally most games are a little dull. However when those gaming diamonds are found, these titles are oozing with playability such as Wii Sports or House of the Dead, Wii gaming at its best! As a big fan of Mario Karts on the Nintendo 64, I’ve been waiting a long time for a successor and I think SEGA have actually done it with their latest racing title. Aptly named Sonic & SEGA All-Stars Racing, it collects some of SEGA’s well known characters as you get involved in some outrageous racing. Best of all, the game engine is quite competent but more so, thoroughly enjoyable as you bump, speed, collect power-ups and knock your opponents off the track. Basically, it’s classic Mario Karts fun but with 21st century graphics and gameplay plus those colourful SEGA characters. Just check out some of the screenshots! Each character has a specific All Star move such as Super Sonic, Banana Blitz and Tails Tornado, allowing a quick way for competitors to get back into the race! Power ups and weapons can also be collected around the tracks and used against the opposition to ensure they don't become a threat to that number one position. Battle it out in single or multiplayer mode! Up to four friends can race in frantic split-screen action, or up to eight players can compete online in the ultimate racing showdown! Characters, characters and more characters! If you could pick the top three SEGA character, it would definitely be Sonic who is also the main billing for this title and of course, the cute pop dancer Ulala from Space Channel 5. A special mention must also be made for Tails, Sonic’s sidekick! But everyone has their favourites and this game is quite a collection, such as Dr. Eggman, AiAi, Amigo and even some very obscure ones such as Ryo Kazuki (Shenmue) and Zobio (House of the Dead). Even though some gamers might be scratching their heads because of their obscurity but in actual fact, these are from some of SEGA’s better games, although maybe not as popular as Sonic. 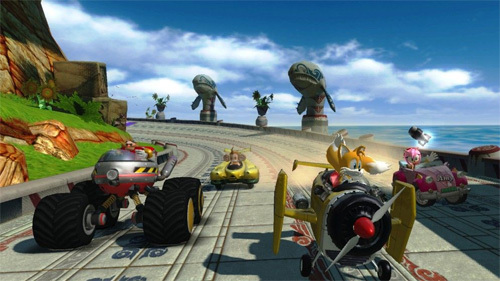 To compliment the racing game, you’ll be racing around some great SEGA gaming locales and be driving a variety of vehicles from cars, planes and even a banana mobile! To liven up the racing aspect of the title and besides the plethora of power-ups and weapons, each character also has their own super-power that allows them zoom ahead of the pack or more specifically to catch up if they're flaying behind. 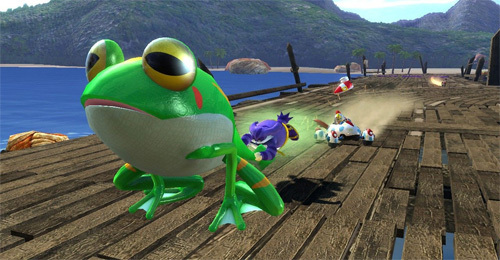 By selecting the “All-Star” move, your character will then employ this move in the game such as Sonic’s “super move” that speedily push you along. To keep things fair, these cannot be used all the time and it’s great for those people who are lagging behind in order to keep in the race. Another interesting aspect of the Wii version is that you can even use your Nintendo Mii’s to compete in the race, although they are a little generic compared to the colourful characters of SEGA such as Dr. Eggman or AiAi. Other little tricks include being the first to start in a race which gives the player a small boost and also drifting as the more you successfully drift around corners, the better boost you get. For me however, nothing is more fun than shooting a boxing glove missile towards your enemy. The wireless control system of the Wii works well with the game as you steer around 24 different tracks in an attempt to win and of course defeat any opponents in your way. The control system is quite simplistic, making it readily accessible to all gamers but where the strategy comes into play is through all the weapons and power-ups. Nothing is more fun than dropping a landmine and seeing your opponent spin out or using boost to push your way position up. Everything comes with a price and the longer you engage in boost, the less control you get over your vehicle and at times, it’s a fun gamble to see how far you can push your own skills against the track. Even though the controls are sturdy, an element of frustration does come into play, especially with some of the AI when you’re trying your most utmost to avoid one of their missiles or heat seekers and it seems that at times, they are a little too perfect in their shots. Graphically, the title is pure SEGA with all its cartoon inspired graphics and worlds that truly pay homage to their diverse and fun universe. As you race through mountains, places like Las Vegas, there are even some dark moments in the game such as the House of the Dead which does bring a smile to your face if you’ve been gaming for awhile. Even though the graphics are a little simplistic, they look great on the Wii and add in a variety of sound effects, all taken from the SEGA universe and a bopping soundtrack and everything comes together quite well. 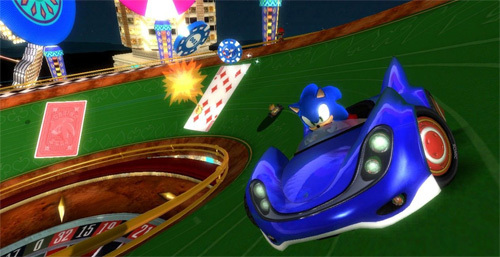 In this world of professional racing simulations and the like, it’s refreshing to play a game like Sonic & SEGA’s All-Stars Racing that puts the “fun” back into racing, without all the seriousness. For a company like SEGA and with so much back history, it’s great that the developers have captured the uniqueness of this company in this game. So what are you waiting for, grab the game and pickup your wireless controllers for the Wii and start racing because this is as fun as they come with perfect controls, a colourful gaming engine and even a few elements of racing or Dr. Eggman strategy. Whether playing this in multiplayer or a solo effort, there’s enough racing in this game to keep even the most ardent of fans happy. Recommended!